Out of print for 20 years, and still often requested . . . and finally available in PDF! 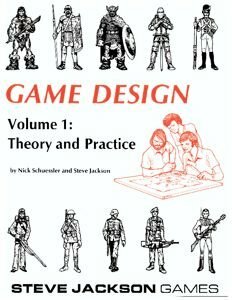 Written for the serious game designer – or for the amateur who'd like to be published professionally – this book, by one of the field's top designers for decades, combines practical advice with theoretical background. 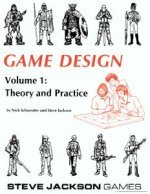 Beginning with a discussion of the theoretical background of gaming, Game Design covers the historical development of the modern adventure game . . . from an occasional pastime for a dedicated few to today's multimillion-dollar game industry. This book was based on a series of articles that Nick Schuessler and I wrote for Space Gamer in 1980 and 1981. We edited and updated them and added new material, and released the book in mid-'81. It was supposed to be Volume 1, to be followed by a Volume 2 that would have included, among other things, more about component design and a discussion of marketing, and maybe a Volume 3 with a worked example . . . but we never got around to it. Some of this book is VERY dated. I expect it will be hard to find any of the texts discussed in the bibliography, and of the 17 magazines listed, only Dragon and White Dwarf still exist. Many of the games cited as examples are likewise hard to find now. And the occasional mention of computers looks pretty naïve 25 years later. But on the whole, it holds up well. All the basic considerations of game creation are still true, and component design and production works about as it always has. And playtesting is still important, darn it . . . So, on the whole, I'm very glad to have this available again, and I hope the hobby finds it useful.